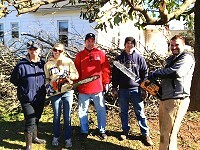 Home » Atlanta REIA Blog » Articles » The Adairsville Tornado Brought Out the Best in Folks! The Adairsville Tornado Brought Out the Best in Folks! Kim and I were at our horse ranch when the Adairsville tornado came spinning through last week. When the rain began blowing sideways and we saw a couple of our trees crash to the ground, we beelined it for the hall closet. Almost immediately, TV news began showing all the destruction the tornado had done to our wonderful little town – it was one video clip after another of total devastation! We have a lot of friends and a number of investment properties in Adairsville and Calhoun. We called to make sure folks were all right, but the phones were out. We prayed – a lot! Here’s the thing: we quickly realized that the tornado was not about the devastation and destruction: It was about all the wonderful people who came together to help make things better! Early the next morning, Kim headed to our church – North Pointe Church – to join with a group of volunteers who were going into town to help folks put the pieces back together. I, on the other hand, headed straight for town on my Kubota tractor. The cops had the streets blocked off. When I pulled up to the checkpoint, the officer asked, “Do you have an official pass?” I answered, “I’ve got a Kubota tractor with a front-end loader and a God-fearing Stihl chainsaw.” The cop chuckled as he said, “That’s good enough for me,” and let me through. Shortly after I joined the two guys already working at the school, a truckload of men from North Pointe Church arrived with chainsaws in hand. More volunteers – complete with a boom truck – arrived a bit later. This is when things really got special. About fifty high school kids, along with a number of our investor friends from the area, arrived on the scene. You’ve never seen anything like it. Volunteers were everywhere. In addition, people like Debbie Boddiford showed up with much-needed food and drinks. We were able to make quick work of the huge oak lying across the little schoolhouse’s roof. So many folks arrived to help that we were also able to clean up two other properties on Cherry Street and one on Elm Street. By the end of the day, dozens of gigantic downed trees had been turned into non-menacing stacks of firewood, and gaping holes in roofs had been covered by blue tarps. Work like this was repeated by volunteer groups all around the area! We have investment homes all around Adairsville and Calhoun where the tornado hit. Luckily, none of our residents were hurt and only a bit of damage was done to a couple of the properties. When we look back on this tornado, the things we’ll best remember are the volunteers – especially all those wonderful kids – who showed up and busted their butts to help make things better! And, we’re grateful to all the first responders and utility workers who helped keep us safe!